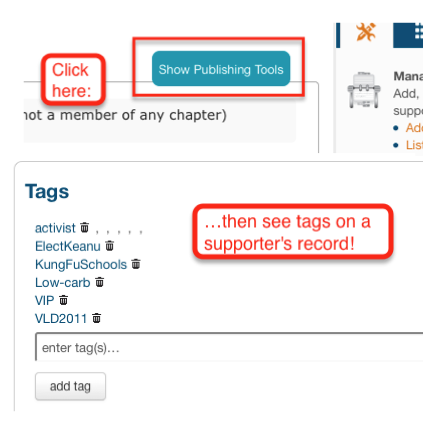 In the Manage Tags screen, you can look at the details for any existing tag, copy or delete/remove tags, and add new tags by clicking the "Add Tag" button. The Tag box will recognize your text as you enter it, and load a menu of similar existing tags so you can easily pick an old tag and apply it without searching. If you enter text that does not match an existing Tag and type Enter or press Add Tag then you'll create a new tag and apply it to the current object or supporter. The following characters are allowed in tags: a-z, A-Z, 0-9, ! : ; % @ / . _ ( ) $ ? # + -. Spaces are OK.
Do not use , (the comma) in a tag name. Several tag-related features in Salsa treat the comma as a delimiter between different tags; a comma in the tag name itself may confuse queries or make other unexpected things occur. Prefixes have no special function apart from helping you explicate or classify your tags. Using the search bar across the top of your Salsa admin pages, search for -- where 'tagname' is the tag you've just applied. Salsa returns everything in the system tagged as 'tagname'. If you've just created a new tag, there will only be the one entry. But you can use the searchability of tags to monitor different things you create in Salsa according to your organization's own actual projects. For example, if you were managing an effort to, say, save the endangered Woodson's Marmoset, you could create an advocacy campaign to raise legislative awareness of the issue, create a petition targeting the appropriate executive branch organization head, create an informational page with a signup form, and send several e-mail blasts about the issue. You could give the same tag -- say, "marmoset" -- to each of those pages. At any point, you could do a tag search for "tag:marmoset" and pull back all the pages tagged "marmoset". Voila! An instant overview of your Woodson's Marmoset effort. Now that you've got different pages and e-mail blasts tagged, you can take advantage of tags' other great feature: stickiness. Any Salsa page you create will apply its tags to the supporters who use it. So, anyone signing up through a page tagged "marmoset" also receives the tag "marmoset" on their individual supporter record. And if there's a gift through an online donation page with that tag, both the donor and the gift itself will be tagged "marmoset". It enriches your searches into full-fledged reports that give you a view of the true scope of your work: now you have at your fingertips the exact number of people who have taken part in a project and the total amount they've given to it. This also opens up a variety of tracking options for you. You can report based on tags, for example, by creating a custom report and "filtering by tag" (see image). Because tags can apply to any data object in Salsa, they have a flexible data architecture. A single tag in Salsa might apply to many thousands of different supporters, and also to many thousands of different donations, and also to many different Salsa pages. Each of these thousands of different connections between a tag and some other piece of Salsa data is defined by a unique entry on the tag_data table. Could you add here -- or somewhere else in the documentation -- when Salsa automatically generates tags? Also, my "Manage tags" page shows 500+ tags (mostly ones generated by Salsa, even though this page deceptively defines tags as "user-applied"), but <100 of those are actually available through the Query interface, so I have no way of knowing what objects are actually tagged with those tags. Is there some other way of figuring out what objects are tagged? I have created several tags using "manage tags" but they do not show up when I begin typing in the 'add tag' field. If I type the entire tag in and add it, a new tag gets created, even though I had made it already. First - the documentation request. That's a great idea! I've added it to my queue of documentation to write. I want us to take our time with it and write it correctly, so it might take a bit but I appreciate the suggestion.